← The Fundamentals of Data Visualization. Mapping data to visual attributes is the essence of data visualization. As visualization is still a new field of research, however, there does not exist a standard list of visual attributes. Below is a list of visual attributes organized chronologically by researcher since Jacques Bertin’s original work in 1967. An additional column is included for vision research – visual attributes identified during research into preattentive perception are candidates for useful visual attributes. The final column identifies some personal research into the attributes of shape that are also potentially effective for data visualization. Table 1. 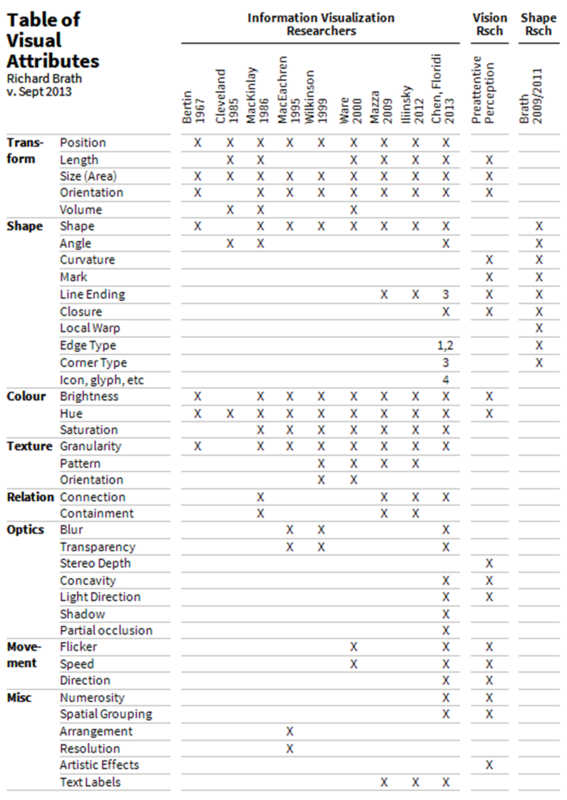 List of visual attributes for information visualization as identified by various research. The first band, Transform, indicates visual properties that can be described by simple geometric transformations such as scale, rotation and translation, are included for reference. The second band, Shape, identifies attributes associated with the topological boundary of a visual object. Each X in the pre-attentitive perception column indicates a visual attribute identified as pre-attentive, from various researchers, e.g. Chris Healey. The final column provides a more expansive list of shape attributes, that was started in 2009 and evolving. Note that this table only indicates the potential use of an attribute and not the particular visual task. For example, information visualization researchers consider the appropriateness of visual attribute with regards to categorical data or quantitative data; where as research in preattentive perception typically only evaluate the use of a visual attribute for under binary conditions (e.g. does an item with a particular attribute exist or not). All attributes need to be understood with respect to applicability to associative, Boolean, categorical and quantitative tasks. Also note Chen and Floridi identify several attributes under different categories that could also be considered shape attributes: (1,2) CF separate line style from edge smoothness, here both identified as edge type, (3) CF identifies separately the notion of a node, internal node and terminator; although these could be considered similar to line ending and corner type, (4) CF provides a classification of different symbolic shapes separating symbol/ideogram from sign/icon/logo/glyph/pictogram and also separate from isotype: while these symbolic shapes may utilize the above visual attributes in their construction, the intention is to encode/decode meaning according to a very different set of rules. [Ber67] J. Bertin. Sémiologie Graphique. Paris. Gauthier-Villars. 1967. [CF13] M. Chen and L. Floridi. An Analysis of Information in Visualization. In Synthese, 2013. [Cle85] W. Cleveland. Elements of Graphing Data. Hobart Press. Summit, NJ. 1985. [Ili12] N. Iliinsky. Properties and Best Uses of Visual Encodings. [Mac86] J. MacKinlay. Automating the Design of Graphical Representations. In ACM Transactions on Graphics Vol 5, No.2. 2006. [Mac95] A. MacEachren. How Maps Work. New York, NY. Guildford Press. 1995. [Maz09] R. Mazza. Introduction to Information Visualization. London. Springer-Verlag. 2009. [Wil99] L. Wilkinson: The Grammar of Graphics 2nd ed. Berlin, Springer Verlag. 2005. [War00] C. Ware. Information Visualization: Perception for Design. San Francisco. This entry was posted in Visual Attributes and tagged data visualization, shape attributes, visual attributes, visualization attributes. Bookmark the permalink.